Kenan Christiansen James Metalarc, 37, taking down equipment after playing a set at Astor Place Station. The popular street musician is considering quitting because of regulations that prevent him from playing. Last month, The Local brought you the story of James Metalarc, a street musician who plays Jimi Hendrix tunes at the Astor Place subway station. On Thursday, Mr. Metalarc, who is also known as Jamal Butler, contacted the blog to report his growing frustrations over MTA regulations which allow police to drive him out of the subway. He added that he was thinking about quitting. His problems arise from the type of music he plays. The MTA’s “Rules of Conduct” do not allow musicians using sound amplifiers to perform on subway platforms, citing that the noise level can interfere with subway operations. Even in the designated performance mezzanines, amplifiers must be kept below the 85-decibel limit. 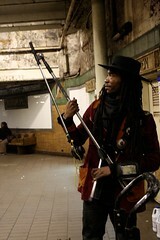 James Metalarc, 37, is a street musician who has been performing in New York City since 2006. For the past six months he’s been a regular at the Astor Place subway station, entertaining commuters with the reincarnated sounds and stylings of the late Jimi Hendrix. He prefers the term street musician to busker and sees his performances less as an act than an extension of his lifestyle as an artist. To him music is an act of worship. “The Rejimi Experience,” came about after Mr. Metalarc took stock of the resemblance between himself and the iconic rock star. He had been playing reggae at the time, and was not getting much attention from his audience. He could barely strum a guitar. He learned Hendrix by ear and it didn’t take long for people to respond. “Hendrix changed everything for me, it gave my act a whole new structure people could relate to,” Mr. Metalarc said.